Some, but not much progress on this denim shirt! Here is the shirt back, right off the bed of the machine and hastily pinned to my photo-wall. It features an inverted top-stitched box pleat. The pleat is open for only about 14 inches. This will allow the shirt to be worn "out", but it will also look neat (and not lumpy) should my client decide to tuck the shirt in. You'll also notice that I've added a loop at CB. Hastily pinned to the form, and still "Under Construction"....but so far I'm satisfied with how this denim shirt is turning out. 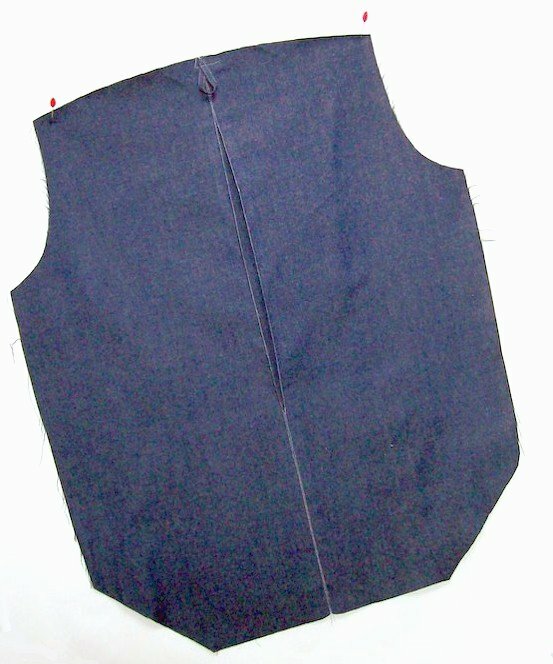 It is being made for a favorite client of mine from a fine cotton denim fabric that has a remarkably smooth reverse side. 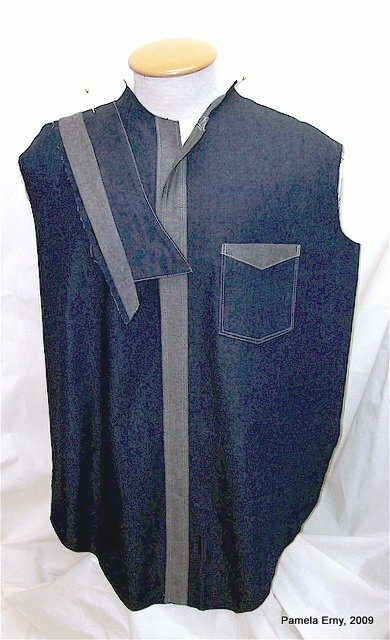 The reverse side of the fabric is so nice that it was able to utilize it for the front button plackets, collar stand and pocket. I haven't cut the sleeve plackets or cuffs yet, and I haven't yet decided to use the face or reverse side of the fabric for them. This is one of those shirts that can look "over-designed' or very contrived if too many contrasting elements are used. So I'll play with scraps and see what happens. I hope to have this shirt finished within a few days. The Waterfall Cowl Revisited...Changing the Pleat Position. Here is another interpretation of Ottobre Woman Issue 2/2009, #5 ...the "Waterfall Blouse"
I always change the front shoulder gathers into a pleat when I make this style. On this newest top, I positioned the pleat near the shoulder point with the fold toward the shoulder seam. Orienting the pleat in this way results in a rounded drape...which I think suits the print of the fabric. When I place the pleat near the neck edge , the drape folds form more of a V shape, as shown to the left (and in more detail further down the main page of the blog). Both of these tops are welcome additions to my fall wardrobe. I made this top for myself last night, and I am very pleased with the way it turned out! 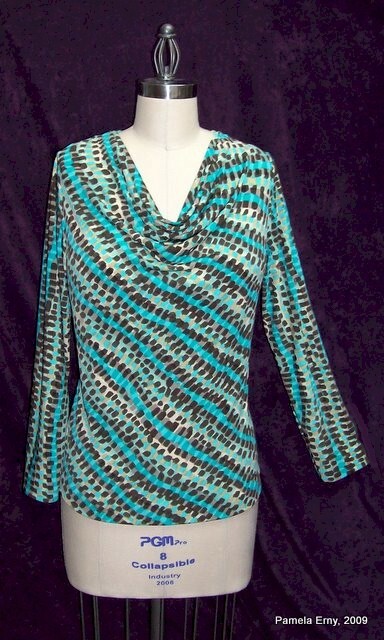 It is the "Waterfall" top from Ottobre Woman, 2/2009 Style #5. Fabric is Poly/Lycra Jersey purchased several months ago from Gorgeous Fabrics. You can see that the print is diagonal, but after draping it on my dress form, I knew it would work well for this style. However, a little diagonal print goes a long way. So after some thought I decided to cut the front and back on the straight grain, utilizing the diagonal "stripes" for the main body pieces. That left the sleeves. 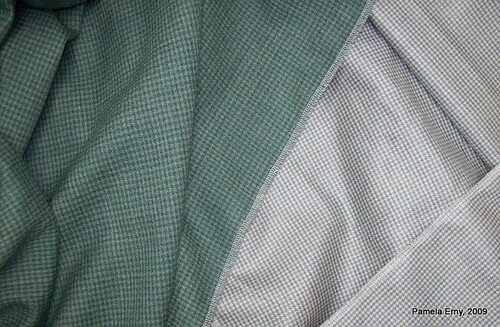 Cutting the sleeves on the straight grain would have made for a dizzying garment...all those diagonal "stripes"...oy! So, I cut the sleeves on the bias. That changed the orientation of the print...the "stripes" now straight, not angled. This gives the garment balance....I won't look as if I am leaning to one side, LOL! Of course, me being me, I couldn't just sew this pattern as directed. The instructions have you gather the front shoulder to meet the back shoulder. In my experience, this tends to make the front shoulder look "puffy" after it is sewn. So instead of gathers, I formed a pleat in the front shoulder seam, placing it close to the neck edge...as you can see in the photo, below. The way you orient this pleat affects the way the cowl will drape. Placing it close to the neck edge with the pleat folded towards the neck, encourages the cowl to drape into a soft "V". Placing the pleat in the center of the seam and folding it towards the shoulder will encourage the cowl to drape in a more rounded shape. So, don't be afraid of diagonal prints! Changing the grain layout can produce a stylish and flattering garment. “Pro-Tailor Deluxe” Fusible Interfacing comes to us from the very finest and Famous New York City Fashion Design workrooms. 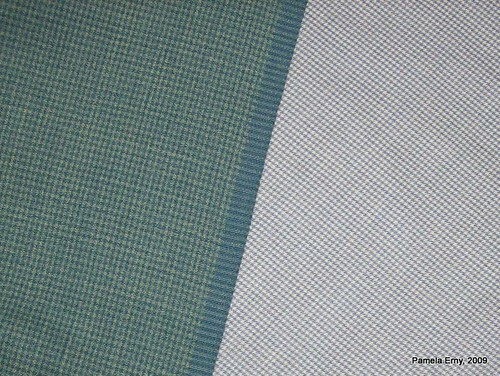 ~Pro-Tailor Deluxe~ is a unique WARP-insertion Woven Fusible Interfacing that is made for tailoring applications like waistbands, collars, lapels, and all other traditional tailoring needs. It is almost like a blend of hair canvas and weft...It is slightly crisp, yet it's special weave gives it a very fluid hand..so hard to describe but simply devine! Use it on wools, suit-weight silks, medium linen, suit-weight microfiber, denim, gabardine, and more. This medium weight Very drapey, Very special interfacing is stable and it Does Not Shrink.It is washable (delicate cycle) and may also be dry-cleaned. 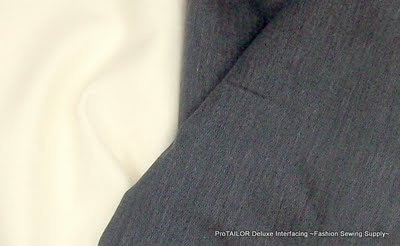 This Medium weight VERY special Interfacing is stable and it DOES NOT SHRINK. It is washable (delicate cycle) and may also be dry-cleaned. 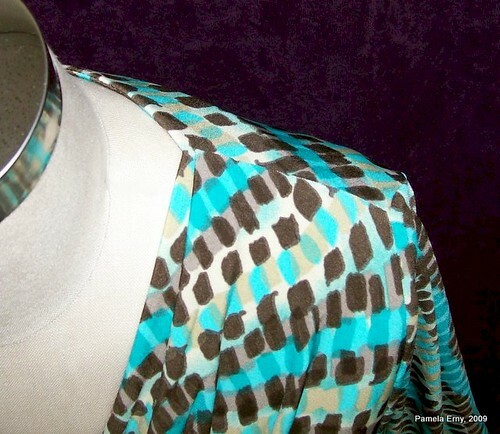 30% Stable Rayon, 70% Polyester -- 66" wide ! 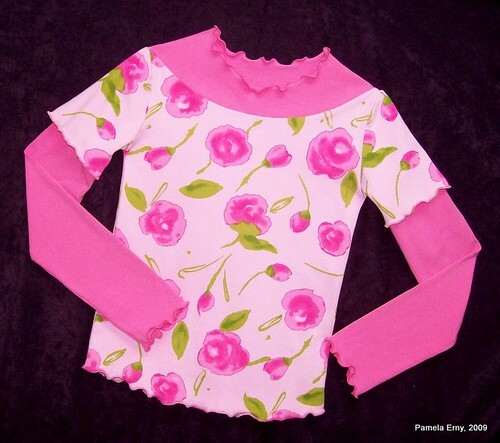 This top for my 10 yr old niece Willow started with a basic t-shirt pattern that I changed to arrive at this design. In addition to curving the hem, I added double sleeves and solid pink curved bodice insets to both the front and back. All the edges were left raw, then just stretched and zig-zagged to "lettuce" (ruffle) them.